Forged with a myriad of stained glass and jewels; the project is the brain-child of British-Chinese artist Chris Chamberlain. 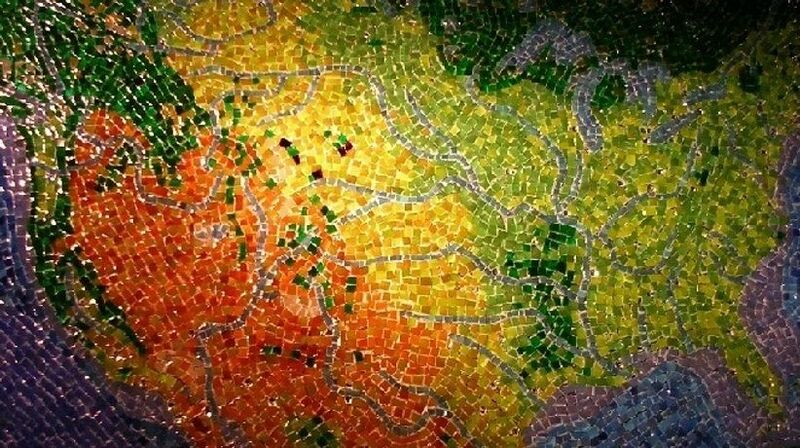 More than 300,000 hand-cut pieces of stained glass show the world from the perspective of looking down from space. Jewels including sapphires, aquamarines, zircons and a conflict-free diamond mark some 1,238 cities in this innovative new work. Rubies and emeralds indicate spiritual centres such as Mecca, Jerusalem and Varanasi, whilst thousands of turquoise coloured pieces, each the size of a grain of rice, depict the great rivers and lakes of the Earth. Entitled Jewel of the Universe, the work is the first in a series that focuses on the vibrancy, uniqueness and beauty of our planet. An interactive installation inside the gallery shows how this remarkable piece was made.